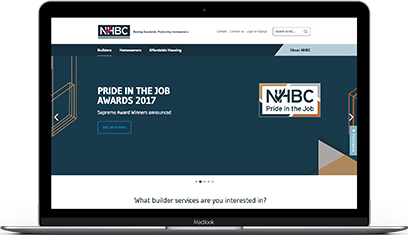 The website is operated by National House-Building Council ("we", “us”, “our” or “NHBC”). We are registered in England and Wales as a company limited by guarantee under company number 320784 and have our registered office at NHBC House, Davy Avenue, Knowlhill, Milton Keynes MK5 8FP. Our VAT number is 876 339 774. National House-Building Council is authorised and regulated by the Financial Conduct Authority (Financial Services Register number: 202261). You can check these details on the Financial Services Register at www.fca.org.uk or by contacting the FCA on 0800 111 6768. Access to our website is permitted on a temporary basis, and we reserve the right to withdraw or amend the service we provide on our website without notice at any time for operational, regulatory, legal or other reasons. We may terminate your use of the website with immediate effect if you breach any of these terms. We will not be liable if for any reason our website is unavailable at any time or for any period. Certain parts of our website are only available to those users who have registered with us. The information transmitted via the website will pass over public telecommunication networks. We make no representation or warranty that the operation of the website will be uninterrupted or error free and disclaim any liability in respect thereof. You may download extracts of any page(s) from our website for your internal purposes and/or personal use. You must not modify copies of any materials you have printed off or downloaded in any way and you must not use any illustrations, photographs, video or audio sequences or any graphics separately from any accompanying text. We provide the content of the website in good faith but commentary and other materials posted on our website are not intended to amount to advice on which reliance should be placed. You must obtain specialist or professional advice before taking, or refraining from, any action on the basis of the content of the website. We give no guarantee, warranty or representation that the content is accurate, complete or up-to-date. We therefore disclaim all liability and responsibility arising from any reliance placed on such materials by any visitor to our website or by anyone who may be informed of any of its contents. Any use of our website is entirely at your own risk. Contracts for the supply of goods, services or information formed through our website or as a result of visits made by you will be governed by additional terms and conditions of supply which will be made available as part of the contract formation process and which you will be required to accept as part of the process for creating the contract for supply. Any material uploaded to our website will be considered non-confidential and non-proprietary and we shall have the right to use, copy, distribute and disclose such material to third parties. Uploaded material must not be defamatory of any person, contain any material which is obscene, offensive, pornographic, hateful or inflammatory and must not promote violence, any form of discrimination or any illegal activity nor be threatening or abusive nor be likely to harass, upset, embarrass, alarm or annoy any person. We reserve the right to remove any material uploaded or posted onto the website in our absolute discretion. While we take reasonable precautions to prevent their existence we will not be liable for any loss or damage caused by a distributed denial-of-service attack, viruses or other technologically harmful material that may infect your computer equipment, computer programs, data or other proprietary material due to your use of our website or to your downloading of any material posted on it, or on any site linked to it. NHBC has a number of UK registered trade marks including (without limitation) the NHBC logo, Buildmark and various other marks which are indicated as such on the website. These terms were last amended on 15 February 2017. National House-Building Council is authorised by the Prudential Regulation Authority and regulated by the Financial Conduct Authority and the Prudential Regulation Authority (Financial Services Register number: 202261). You can check these details on the Financial Services Register at www.fca.org.uk or by contacting the FCA on 0800 111 6768.